Andrew Carnegie's greatest legacy may be Carnegie Hall, the nirvana of most musicians, on the southeast corner of 57th Street and Seventh Avenue, but his former mansion at 2 East 91st Street is the lynchpin of the very desirable Carnegie Hill neighborhood on the Upper East Side. Set in a very large garden surrounded by a tall, handsome fence with big granite pillars, the Carnegie property takes up almost half the block bounded by Fifth and Madison Avenues and 90th and 91st Streets. The house itself is huge but rather dawdy, a brown-brick Beaux Arts-style pile with a very large and handsomely wood-paneled central hall and grand staircase. At the east end of the building is a lovely high conservatory and the balustraded balcony at the entrance from the house to the garden is especially nice. The building was designed by Babb, Cook & Willard and completed in 1902. "Shortly after Andrew Carnegie purchased this property in 1898 he is quoted as having uttered the somewhat curious statement concerning his plan to build 'the most modest, plainest and most roomy house in New York.' At 64 rooms, the house was certainly roomy, befitting one of America's wealthiest men. Carnegie had made his fortune in steel, retiring in 1901 with a net worth of approximately $300 million. The Fifth Avenue house was planned as Carnegie's retirement home. Here he could amuse himself in his garden, laid out by Schermerhorn & Foulks (the plan is largely intact and includes, at the east end, what the original plans refer to as a 'rockery') and could meet with those involved in his favorite charitable endeavors.It was the the use of simple brickwork, on an avenue lined with grand marble and limestone palaces, that lends this large dwelling its 'modest' and 'plain' appearance. 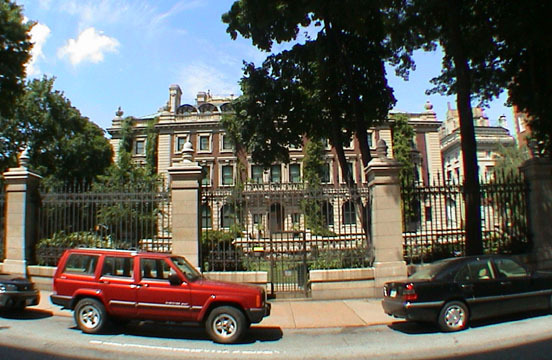 Following Louise Carnegie's death in 1946, the house was used by the Columbia University School of Social Work and in 1968 became the Cooper-Hewitt Museum. The Cooper-Hewitt's extensive collection of objects relating to all aspects of design was established at the Cooper Union in 1897 by Sarah and Eleanor Hewitt and closed in 1963, only to be saved by the Smithsonian Institution which accepted the donation of the collection.The Carnegie Corporation donated the house to the Smithsonian and architect Hugh Hardy designed the sensitive museum conversion completed in 1976." The Cooper-Hewitt Museum's name was eventually changed to the National Design Museum and it has held a great many excellent exhibitions over the years. "The Carnegie House has three below-ground levels with all the floor and walls covered in tile and with enough mechanical equipment for a grand hotel....The coal bin held 200 tons of coal and was linked ot the furnace by a minature railroad track upon which a small coal car operated. When the furnace ran low the coal bin automatically dumped a quarter ton of coal into the car, which made its way to the furnace to deposit its load. The wine cellar had terra-cotta walls honeycombed with small openings, each the perfect size for one bottle. And instead of of speaking tubes througut the house there were twenty telephones." On 91st Street, Carnegie's home quickly inspired others to build very impressive, albeit smaller, smaller mansions. Otto Kahn, for example, built a sumptuous Italian Renaissance-palazzo style townhouse at 2 East 91st Street that is not the Convent of the Sacred Heart School. Henry Phipps, a partner of Carnegie's, built an impressive mansion at 2 East 87th Street that eventually was replaced by an apartment building. The property is at the highest point on Fifth Avenue on the Upper East Side and its garden is opposite Engineer's Gate, an entrance to the runway around the Central Park reservoir and an exit from the park's north drive at 90th Street. The garden is opposite the impressive limestone Episcopal Church of the Heavenly Rest on 90th Street and the museum is just to the west of the Spence School on 91st Street. The museum has a very nice gift shop and bookstore as well as a small café that opens onto the garden where there are chairs and tables. The Carnegie Hill neighborhood generally refers to the area between 86th and 96th Streets and Fifth and Lexington Avenues and since the 1980s it has become one of the most desirable residential neighborhoods in the city because of its many private schools and cultural and religious properties.